Set up a lever that lifts a (sometimes very heavy) weight. Set up the see saw with the 2X6 centred on the split log. 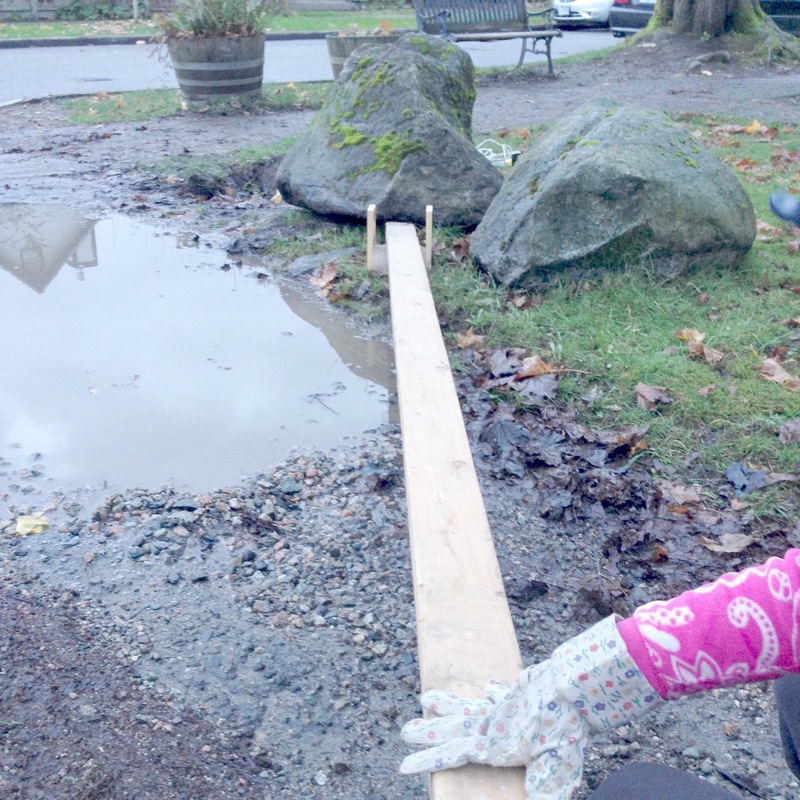 Ask a pair of students to experiment with the see saw. They can either lift a large block (in the photo), or they can try lifting each other. (The objects are heavy, so the students should work slowly and carefully with good communication within the pair). Prompt the students to move the fulcrum and see what difference it makes. They should find that when the fulcrum is near the load/student, they are easy to push it up in the air, but when it is far from the load, it is very hard (if not impossible). The lever arm (plank of wood) is drawn as a straight line, and the fulcrum is a triangle under the line in the correct position. Use arrows to show where force is applied (at one end of the see saw - also called the effort), and where the resulting force is felt (under the concrete weight - also called the load). Ask the students how the height of the ends of the see saw varies as the fulcrum is moved. They can measure the distances for more accurate recording of the results. Less force over a greater distance (with the fulcrum near to the weight) is an easier way to lift the weight. However, in this case the weight will not move as high. 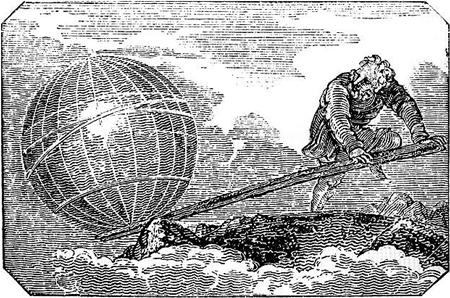 The amount of work balances: less force over a greater distance (at one end of the lever) balances more force over a smaller distance (at the other end). 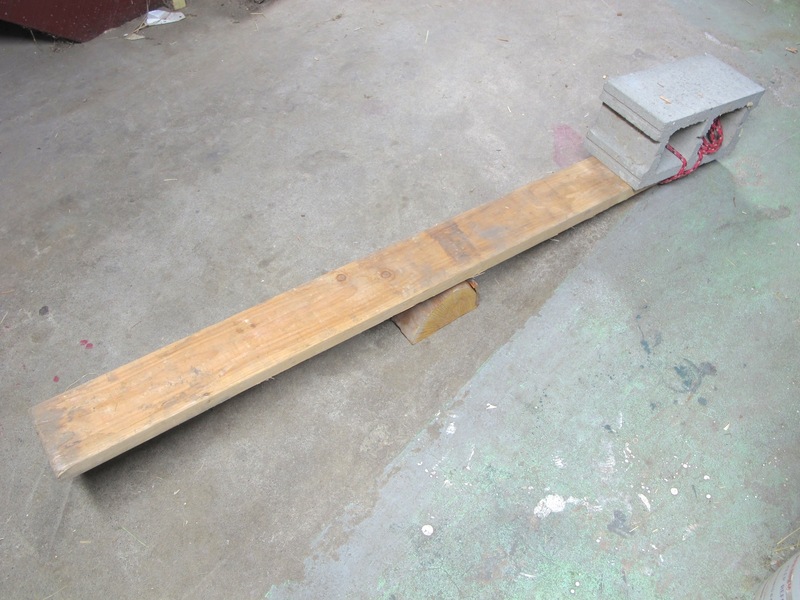 Use a long 2X6 or 2X8 as a lever, and a split log as a fulcrum. If students have already experimented with fulcrum placement, ask them to tell you where the fulcrum should be placed to lift a very heavy object [it should be placed very near the rock]. With this arrangement a large rock can be lifted up a few centimetres (higher could be dangerous incase the rock slips sideways) by a child. Optional: show photos of how people have been using levers for lifting heavy things for thousands of years. Can also use to lift a smaller weight high with a heavier weight - see the photo of the upturned chair supporting a lever. A pot of water is used to lift a marble up high - students were challenged to use a pot of water to lift a marble to table height. The marble can be successfully lifted when the fulcrum is very near the bucket of water, so that the other end holding the marble can swing up high enough to reach the table top. 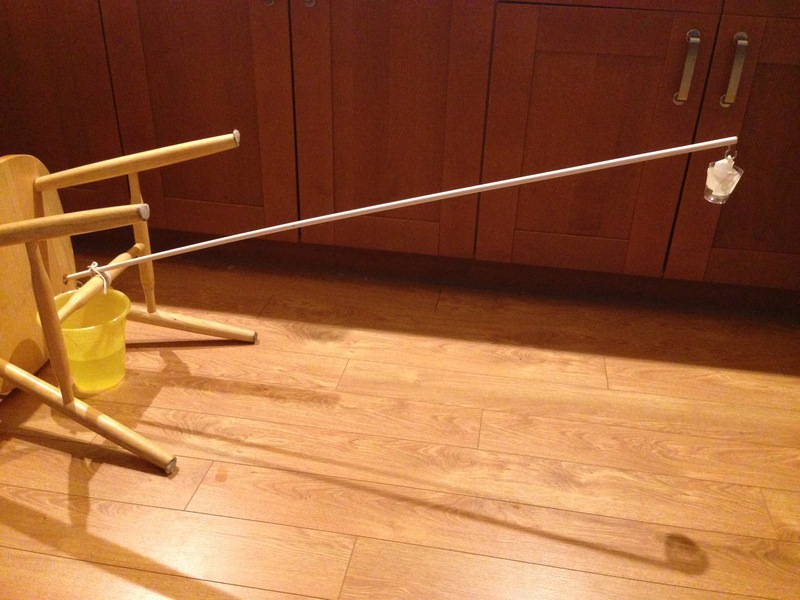 Review how a lever works: a lot of force at one end moving a small distance (the bucket full of water) produces a smaller force over a greater distance at the other end (hence the lighter load of the marble can be lifted high enough to reach the table top). Relate to other levers students might be familiar with e.g. see saw.